Tequila Lime Orangey Chicken! yum. I love this marinade , it’s full of citrus , spicy and savory. Almost everyone has a bottle of Tequila in the pantry right? I do and I can’t remember the last time I drank it, but I do cook with it. I used gold tequila , but didn’t use a very expensive brand. Be careful with the jalapeno, use gloves. I sometimes leave a few seeds because we like it hot, but remove all seeds if you don’t like it very spicy. This marinade packs a lot of flavor. I always let it marinade overnight. It’s an easy recipe and I make it on the grill mostly in the summer, delicious cold as well used in salad the next day if you have any left over. Original recipe calls for 2 lbs. of chicken, I use the thinner chicken cutlets because I prefer them. Use whatever you like. This marinade is also delicious on chicken on the bone, just use a chicken cut up in 8’s. I use a plastic bag to marinate the chicken in fridge. Right before grilling, I put chicken on a plate and lightly sprinkle with kosher salt and a little freshly ground black pepper, this is important because the chicken needs the salt and pepper. The original recipe comes from The Barefoot Contessa but I’ve taken liberties with it, thanks again to Ina. I also think that this would be awesome cut in strips and served with salsa , guacamole and some soft tortillas. 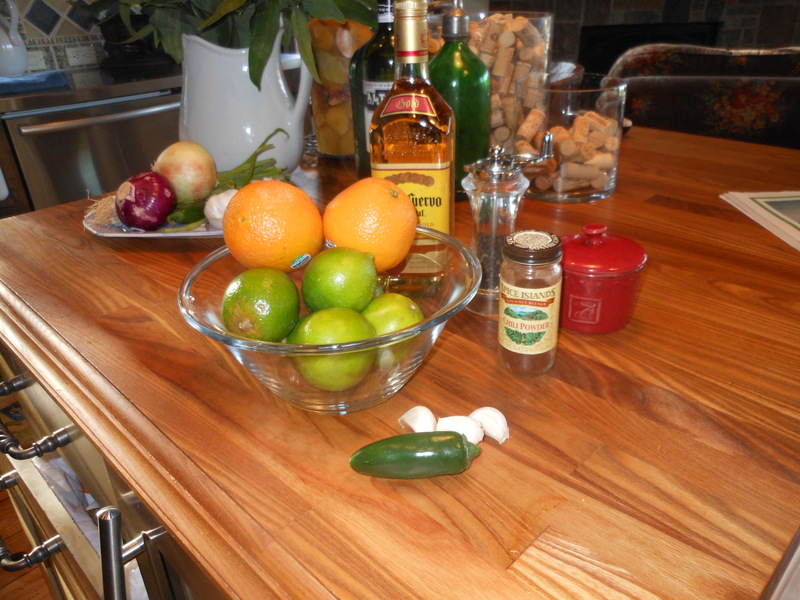 Combine the tequila, lime juice, orange juice, chili powder, jalapeno, garlic, salt and pepper in a large bowl. I used my mini chopper for jalapeno and garlic. Pour over chicken breasts and refrigerate overnight. As I said I put all ingredients in a large hefty ziploc bag. Heat grill, and spray or brush rack with oil to prevent sticking ( which I always do) Grill the chicken for about 4 minutes on each side ( depending on what kind of chicken you are using) they should have nice marks and be browned. Turn the chicken and cook other side for the same. Remove from grill to a plate. Cover tightly with foil, and allow to rest for a couple of minutes. This entry was posted in chicken, marinade and tagged Chicken and tequila, tequila chicken marinade. Bookmark the permalink.